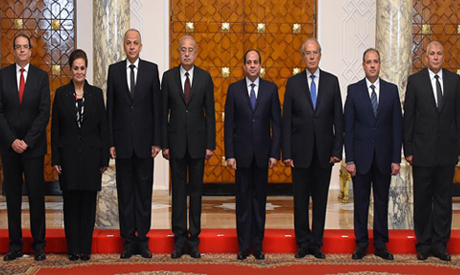 Nine newly-appointed Egyptian ministers and five governors, including Egypt’s first female governor, were sworn in on Thursday before President Abdel-Fattah El-Sisi in Cairo as part of a cabinet reshuffle. The reshuffle, which mainly involves ministries related to public services and the economy, was approved by parliament on Tuesday. The ministries of supply and of internal trade and industry were merged, as were the ministries of investment and international cooperation. Beheira governorate – Nadia Ahmed Abdou Saleh, an engineer and former deputy governor of Behiera. Alexandria governorate – Mohamed Ali Sultan, a doctor who served as head of the Health and Medical Services Department at the Ministry of Health. Qalioubiya governorate – Army General Mahmoud Abdel-Ghaffar Afifi, the former governor of El-Wadi El-Gedid. El-Wadi El Gedid – Former Army General Mohamed Salman Moussa El-Zamlot, the former commander of the Northern Military Zone. Menoufiya governorate – Ahmed Ali El-Shaarawy, the governor of Daqahliya governorate and former head of the National Liver Institute in Menoufiya. Egypt witnessed the last cabinet reshuffle in March 2016, when 10 new ministers were appointed, including the ministers of finance, investment and tourism. Prime Minister Sherif Ismail has been leading the cabinet since 2015.